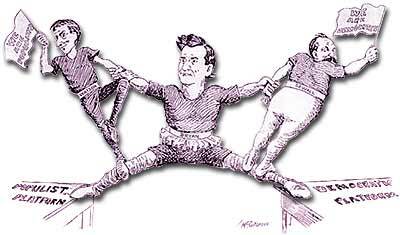 "A great exhibition, but rather trying on the man in the middle." William Jennings Bryan is shown pulled in two directions as he campaigns on both the Democratic and the Populist Party platforms. Everything seemed to be falling into place for the Populists. James Weaver made an impressive showing in 1892, and now Populist ideas were being discussed across the nation. The Panic of 1893 was the worst financial crisis to date in American history. As the soup lines grew larger, so did voters' anger at the present system. When Jacob S. Coxey of Ohio marched his 200 supporters into the nation's capital to demand reforms in the spring of 1894, many thought a revolution was brewing. The climate seemed to ache for change. All that the Populists needed was a winning Presidential candidate in 1896. Ironically, the person who defended the Populist platform that year came from the Democratic Party. William Jennings Bryan was the unlikely candidate. An attorney from Lincoln, Nebraska, Bryan's speaking skills were among the best of his generation. Known as the "Great Commoner," Bryan quickly developed a reputation as defender of the farmer. When Populist ideas began to spread, Democratic voters of the South and West gave enthusiastic endorsement. At the Chicago Democratic convention in 1896, Bryan delivered a speech that made his career. Demanding the free coinage of silver, Bryan shouted, "You shall not crucify mankind upon a cross of gold!" Thousands of delegates roared their approval, and at the age of thirty-six, the "Boy Orator" received the Democratic nomination. Faced with a difficult choice between surrendering their identity and hurting their own cause, the Populist Party also nominated Bryan as their candidate. William McKinley stayed out of the public eye in 1896, leaving the campaigning to party hacks and fancy posters like this one. 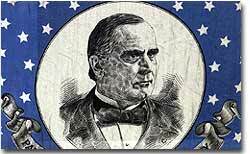 The Republican competitor was William McKinley, the governor of Ohio. He had the support of the moneyed eastern establishment. Behind the scenes, a wealthy Cleveland industrialist named Marc Hanna was determined to see McKinley elected. He, like many of his class, believed that the free coinage of silver would bring financial ruin to America. Using his vast wealth and power, Hanna directed a campaign based on fear of a Bryan victory. McKinley campaigned from his home, leaving the politicking for the party hacks. Bryan revolutionized campaign politics by launching a nationwide whistle-stop effort, making twenty to thirty speeches per day. When the results were finally tallied, McKinley had beaten Bryan by an electoral vote margin of 271 to 176. Many factors led to Bryan's defeat. He was unable to win a single state in the populous Northeast. Laborers feared the free silver idea as much as their bosses. While inflation would help the debt-ridden, mortgage-paying farmers, it could hurt the wage-earning, rent-paying factory workers. In a sense, the election came down to city versus country. By 1896, the urban forces won. Bryan's campaign marked the last time a major party attempted to win the White House by exclusively courting the rural vote. The economy of 1896 was also on the upswing. Had the election occurred in the heart of the Panic of 1893, the results may have differed. Farm prices were rising in 1896, albeit slowly. The Populist Party fell apart with Bryan's loss. Although they continued to nominate candidates, most of their membership had reverted to the major parties. The ideas, however, did endure. Although the free silver issue died, the graduated income tax, direct election of senators, initiative, referendum, recall, and the secret ballot were all later enacted. These issues were kept alive by the next standard bearers of reform — the Progressives. Dozens of articles on many interesting aspects of the 1896 Presidential campaign are offered on this Vassar history department site. Pictures, a timeline, and more than a dozen sketches of political leaders are some of the highlights. Several universities contributed essays and images to this website on the 1896 Presidential election. Several political cartoons and links to party platforms. A number of essays, images, political cartoons and more about President William McKinley. From Ohio State University. Here is the full text of William Jenning Bryan's speech give during a debate on monetary policy at the Democratic National Convention. From the Douglass Archives of American Public Address. This page from the Presidents of the United States website includes a biography of William McKinley, information on his cabinet, election results from 1896 and 1900, and links to other resources. Republicans, led by McKinley's campaign manager Mark Hanna, raised a record $3,500,000 for the 1896 Presidential election. President McKinley's second inauguration in 1901 was recorded on film. 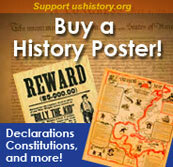 You can see the historic moving picture of the historic event at this website!